On loan for a local assignment, Max "Caveman" Decker already feels at home in the backcountry of Wyoming. Protecting one woman—even petite spitfire Grace Saunders—is a vacation to the Delta Force warrior. But Grace thinks something darker is at work than the murder she witnessed. It wasn't a case of the wrong place at the wrong time—it was her "curse." Every man she gets close to dies. Now she's saddled with Decker, her sworn protector, who won't leave her side. Any hope for a simple assignment will change once they're living under the same roof, where Grace's curse will be just as inescapable as the crosshairs of a killer. 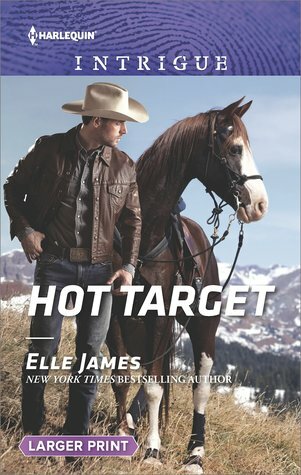 Another exciting book in the Ballistic Cowboys series by Elle James! The excitement starts shortly after the book begins and never stops throughout as they try to outrun the target on their back! Max “Caveman” Decker isn’t happy to be loaned out to Homeland Security for some kind of a job in small town Wyoming when he finally gets clearance to return to his job Delta Forces. He’s being given a glorified babysitter job! His tune soon changes when the person he’s now protecting turns personal! Grace Saunders had no clue she was going to witness a murder when she was out in the woods that day. All she wanted was to check on one of her wolf pack, and now she’s being hunted herself! Grace is cursed with bad luck in the love department, so she’s leery of ever getting close to someone again … so why does she seem unable to resist Caveman?